Carnival of Space #155 is here. Carnival of Space #155 is now up at Backseat Driving. With Haiku's even! These amazing images of Enceladus, Solar Sails for real, life on other planets, Voyagers woes, Blaack Ho;e Auroras and much, much more. Get on your bike and ride on over! The ISS returns to the evening skies. The International Space Station returns to the evening sky this weekend for most of Australia, and can be seen in the early evening for about a week. A couple of passes will be very bright (almost as bright as Venus) and will pass very close to the bright planets Venus, Mars and Saturn. The sky will be either quite dark or in late twilight and the ISS and Venus will be very obvious. In Southern Australia (South Australia, Victoria and Southern WA) the ISS is seen on Monday evening (31 may) at roughly 6:35 pm (SA, WA) or 7:07 pm (VIC) local time. It will be not far from bright Venus in the north-west. In Adelaide at 6:39 am the ISS will be passing Mars. In Perth this is more like 6:40 pm, and in Melbourne the ISS enters Earths shadow before reaching Mars. NSW and QLD don’t see anything as near as spectacular, but on Tuesday June 1 the ISS passes close to the bright planets on as seen from Sydney and passes Sirius and Canopus as seen from Brisbane. Darwin has a few less spectacular passes. Back on the 20th of May, Mars and the Moon were close. I got this shot, with Venus peeking up from below the horizon (bottom left). You will probably need o click on the image and embiggen it to see Mars just below the Moon. Choosing a winning entry for the competition was hard, I wish I could give you all something. For example Joel's post resonated with me as I've canoed down the same river, and watched the stars from its banks. Andrew, I still have my first 50 mm telescope, which also trembles at an eye blink. Chari's eclipse story resonates too. Chris's experiences too struck a chord, as did the tale of the mysterious object. But for sheer drama, the winner has to be Tom. His story forthwith, (and a copy of Hunt for Planet X will be heading his way as well). I could tell you about my solar eclipse experience in 1999. It was overcast all day. Raining. This is Germany in Summer (August) - but rain is just part of living over there. To see the event all of Germany gets in their car and drives to the southern states - Autobahn chock full. (One man dies because during the eclipse he doesn't see the need to actually stop driving his car and runs into a bridge pylon. Several people go blind because they look at the sun with unprotected eyes or with inappropriate protection (like using a CD or Aluminium foil instead of proper solar viewing glasses). But I'm in a car of 4 people, driving in dense traffic for hours until we enter the predicted eclipse path and it is raining! The sky is cloudy. We keep going south, keep listening to the weather and traffic forecast. We're cutting it close, entering the path probably only half an hour before the eclipse starts because there's so much more traffic than we anticipated. Clouds overhead always. Some patches of blue sky open up here and there, but not underneath where we expect the sun to be. And then the time has come - first contact has already happened - it takes a while from first contact to totality though. So we park the car and lie down in a field. Hoping. And then the clouds actually parted for the duration of totality!! That was SO uncanny! Moon was halfway across the sun when the clouds parted, and we got to enjoy the whole spectacle of weird purple light, we tried to see crescent shadows but couldn't, and generally just lay amazed in the field appreciating how inCREDibly lucky we were. And shortly after totality as the moon was moving away and a limb of the sun started to reappear the clouds shut the skies off again. So if you're thinking of travelling to Queensland for the November 2012 eclipse, appreciate that the chance for clear skies is good there - but even if it's cloudy it might still be worth going. 'Nuff said. Last Day for the Competition. This is the last day to get your entries in for the competition. 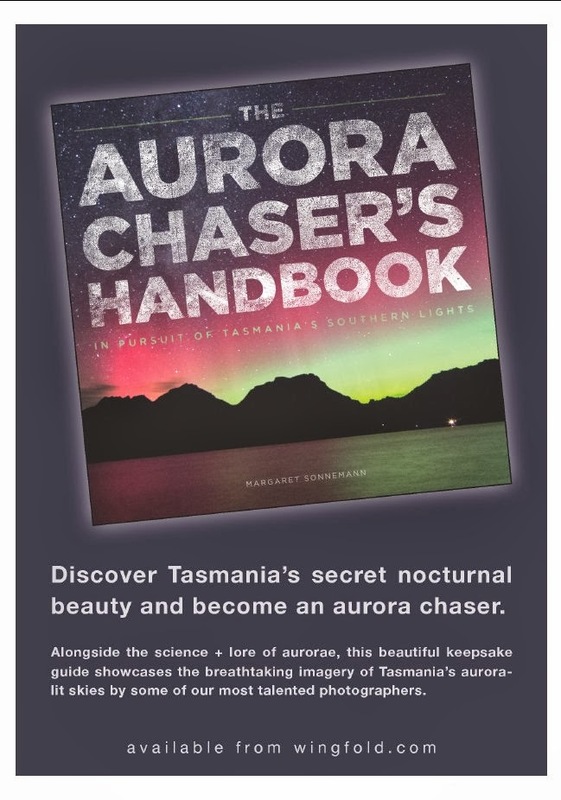 All you have to do is write in the comments here about your most enthralling amateur astronomy experience, be it a stunning telescopic view, a meteor blazing overhead or sharing an eclipse with your family and if it is judged to be the best such story YOU will get to be the 2000th post and get a copy of “The Hunt for Planet X”. Have fun! The Full Moon is Friday May 28. Venus is readily visible in the twilight. Saturn is seen in the evening above the northern horizon near the bright stars Regulus and Spica. Mars is very close to Regulus. Jupiter is easily seen in the morning sky, with Mercury below it. 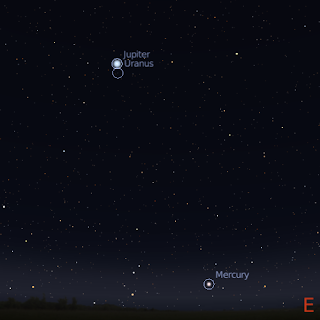 The morning sky facing north-east in Australia on Sunday May 30 at 5:30 am local time showing Jupiter, Uranus and Mercury. The Full Moon is Friday May 28. Mercury is in the morning sky and is visible low to the horizon below Jupiter. Mercury is at its best this week. 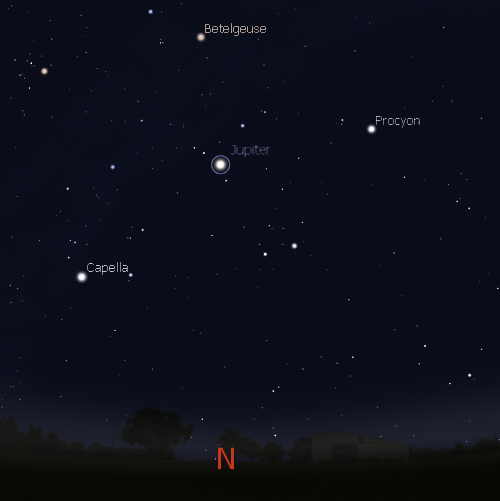 Jupiter is clearly visible in the north-eastern sky as the brightest object in the early morning. Jupiter is now high enough for telescopic observation to be rewarding. Jupiter looks a little different now that one of its bands has disappeared. 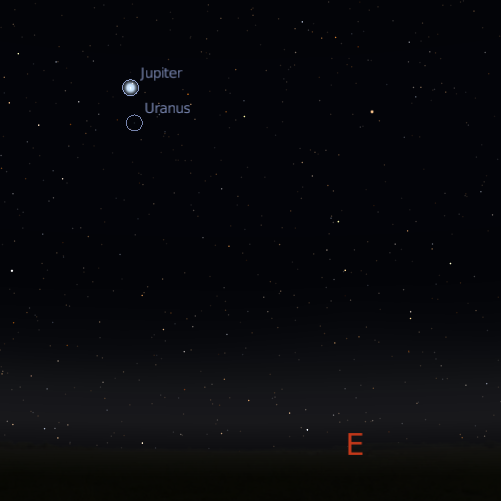 Jupiter and Uranus are close together and can be seen near each other in a pair of binoculars. They will be at their closest next week. 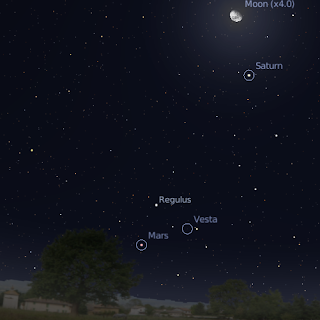 Evening sky looking North showing Mars, the Moon, Saturn and bright stars at 10:00 pm local time on Sunday May 23. Click to embiggen. Bright white Venus is now readily visible above the western horizon from half an hour after Sunset, (even before) until past the end of twilight (about an hour and a half after sunset). On Friday 28 May Venus is very close to the moderately bright star Metsuba in Gemini. 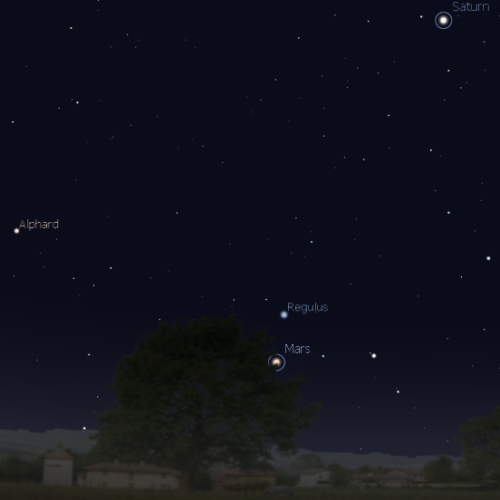 In the evening Mars can be seen low in the north-western sky. It has faded a lot, but is still the brightest (and clearly red) object in that part of the sky. Mars will be just under Regulus, the bright star in Leo the lion at the end of the Week. However, the closest approach to Regulus will be newt week. Mars forms a line with Regulus, Saturn and Spica. Saturn is rising before Sunset and is easily visible in the evening sky as the bright yellow object between the bright stars Regulus and Spica, just up from Mars. Now is still a very good time for telescopic observation of the ringed world. Saturn is quite high in the sky for the best telescopic views at around 8 pm. Saturn's' rings are opening, and look quite beautiful, even in a small telescope. On the 2nd of June, Saturns' Moon Titan cruises just below the planets south pole. Don't forget about the competition! A Nice Shot Of Venus and the Moon. Reader Jake Gumley sent in this marvellous image of Venus and the Moon glimpsed through cloud at Canberra on 16 May at 6.15pm (click to embiggen, naturally the image is copyright Jake Gumley, so don't use without asking him). Venus looks a bit like Saturn in this image. Do you have a good memory of this or other conjunctions? You only have two days to enter them in the competition! Carnival of Space #154 is here. Carnival of Space #154 is now up at Weird Warp. There's Spaceship colonies, the last flight of Atlantis, advanced rockets and much much more. Lift-off for the carnival now. Maybe you might find something that inspires a memory for the competition. The ISS Was Really Bright - Woot! 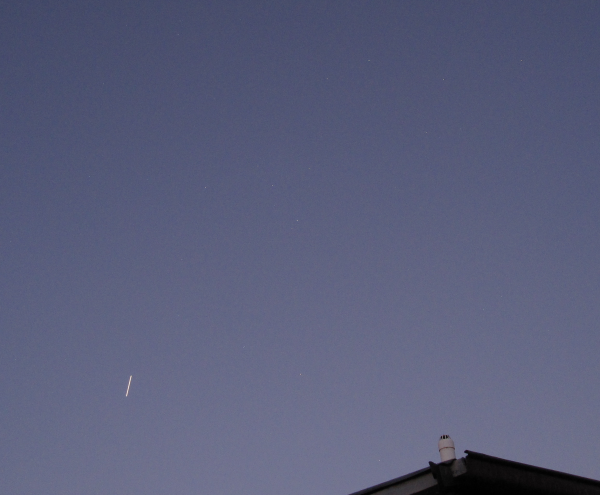 The ISS heads for Jupiter on the morning of May 22, 2010 as seen from suburban Adelaide. I got up far too early to prepare for the International Space Station pass. But dressed in my warm woollies with a cup of hot tea in hand I watch the stars fade into the twilight in anticipation. There was an extra delight as there was an iridium flare at 6:12 while I was setting up. I also did a quick telephone interview with 891 Adelaide Local radio to extol the virtues of watching the ISS over head. Unfortunately I forgot Thierry Legault's name, so people couldn't go searching for his amazing images. 6:30 rolled around, but not the ISS. I scanned the sky anxiously, hoping I haddn't mislead anybody, inluding the radio listeners. Then the ISS appeared over the top of the house it was hding behind, astonishingly bright, and started it's course across the sky. The ISS appears below the hook of Scorpius's tail, click to embiggen. The ISS sailed high up to near the zenith, passes down beside Jupiter, fading as it went. The pictures do not do it justice. Here's my animation of the ISS going past Jupiter. How was your ISS experience? Do you want to write it up for the competition? 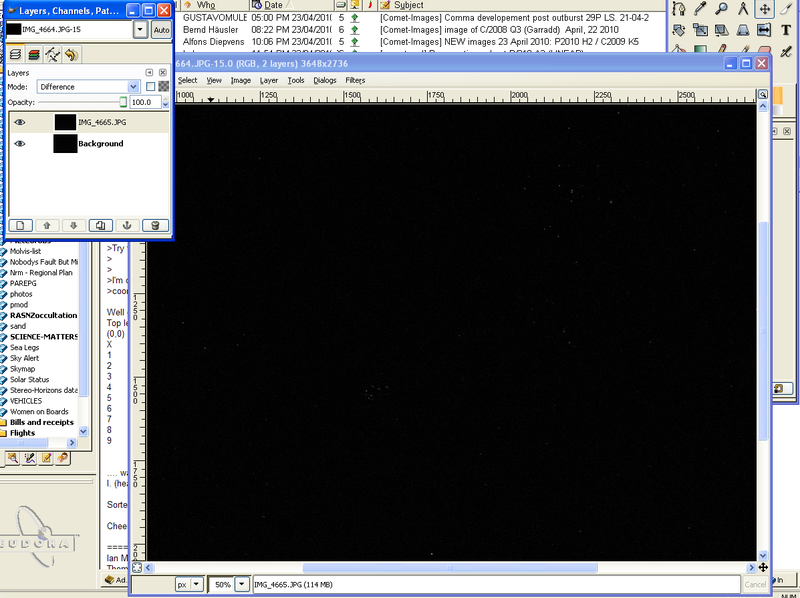 In the last installment I went through how to use The GIMP (sorry John) to produce astronomical overlays so you can use multiple images to enhance your sky pictures. In this installment I’m going to show you how to do animations. When making our overlays, we found that the sky moved in between each image, which was quite annoying when trying to align images. 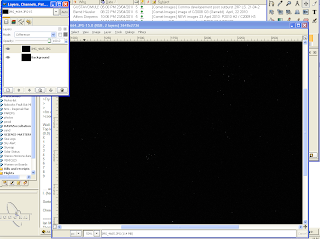 However, we can use this to our advantage and make animations of astronomical objects. There are two basic types of animations, animations of scenes taken directly through a digital camera of some type (the Moon setting, the International Space Station going past, eclipses warning, all BIG files) or images taken through a telescope (eclipses again, occultations, more Moon stuff, Jupiters’ Moons, Saturns’ Moons). But they all have roughly the same approach. The first step is always the setup. For taking images of Moon set or the ISS etc. you will need your camera set up on a tripod or support of some sort and make sure that the desired object will be in the field of view. For satellite shots this can be tricky, as there is often no bright object that will turn up in the view finder. I scrunch down with my eyes level to the camera, at the same angle that the camera is to the ground, and check to see if its approximately pointed, then do some test exposures to make sure things are in the right place. Once you are set up, take some exposures. I usually have the camera set to take exposures after a 2 second delay to avoid camera shake. That and the delay in saving the image to the camera is enough to get good sequential images of the ISS or iridium flares as the trace across the sky. You may want to have longer (but measured) intervals between successive exposures for moon set for example. For “through telescope” images, I either use my modified webcam or a camera adapter attached to the lens. For images of Jupiter’s Moons, or the animation I made of Vesta, I shot an image every 15 minutes. How many images you shoot depends on a number of factors (how smooth you want the animation, how long the object will be visible, how much hard disk space you have. 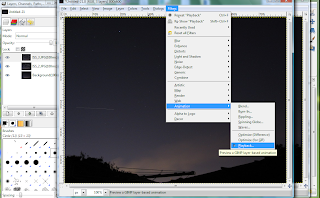 Once you have your images, you can now open them in the GIMP. If you have substantial hot pixel issues, you have to subtract the dark frames as explained in then last issue. Also, for an animation, you will need to resize you images. 4000x3000 pixel images that result from 12 megapixels cameras take up a lot of territory, and will be very unwieldy. I rescale mine to 800x600 individually. Having done that close all your images except the first image in the sequence (or re-open it if it was closed). This is your base image. Now open each subsequent image as a layer as described previously. You don’t need to do any fancy aligning if you tripod is steady, everything will be aligned properly. I do need to align my telescopic images, as my 4” scope is completely unguided, and I have to continually recenter the image. 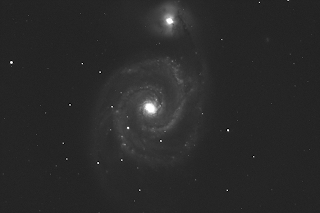 With the 8” scope, I’m rubbish at polar alignment, so it drifts a bit and I need to align the images too. So use the same procedure as for aligning images (using the difference feature) as in the previous installment, but once aligned set the images to normal (not addition). Now you have your stacked images the next bit is easy. Choose Filters | Animation | Optimise. You have choice of standard optimise, and optimise for GIF. Use the latter if you want to make an animated GIF, the former if you are making an AVI. One optimised, use the Filters | Animation | Playback to see what your animation looks like. You may decide to crop the image at this stage to make the animated object more prominent (and also make the files smaller all those files above are around 1.8 Mb). Once you are happy, now all you have to do is save. To save as an animated GIF, type a GIF extension to the file, then choose save as animated gif option in the save dialog and viola! you are done. For saving as an AVI, in GIMP 2.6 do the same thing as for the GIF (ie type an AVI as the file extension. 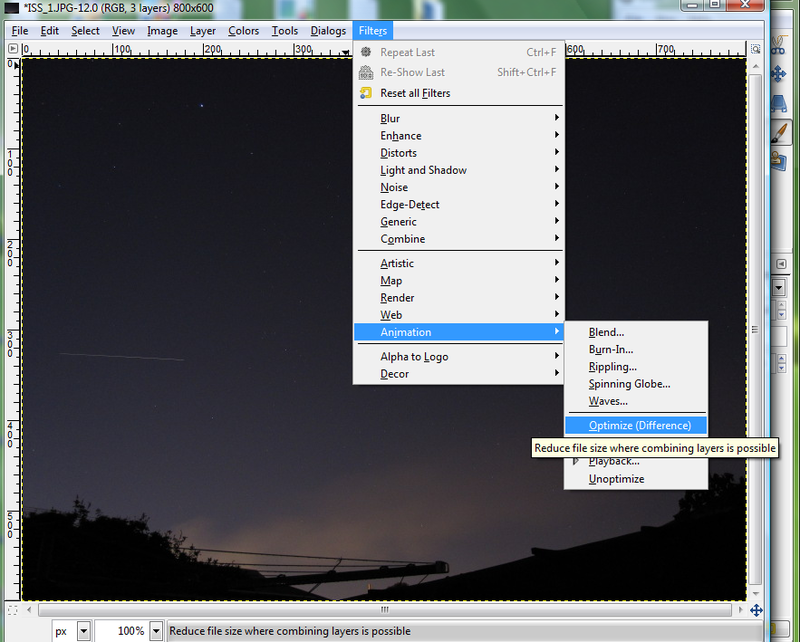 If you have GIMP 2.2 or 2.4 you will need a plugin to allow you to save as an AVI. And you are done! Now enjoy your animation! This weekend (22-23 May) the International Space Station will be very bright (almost as bright as Venus) and will pass very close to the bright planets Jupiter and Mercury. The sky will be in twilight but the ISS and Jupiter will be very obvious, very good for early bird risers. In South Australia and Southern WA the ISS is seen on Saturday morning at roughly 6:30 am local time. In Adelaide, at 06:33 am the ISS will be high in the northern sky, very bright and moving East, a minute or so later it passes Jupiter (the brightest object in the sky aside from the ISS at this point, and then around 6:36 am it passes Mercury low in the north-eastern sky. In WA the ISS passes closer to Mercury than Jupiter. On the East Coast the ISS passes close to the bright planets on Sunday morning at roughly 6:00 am local time. In Sydney, at 5:54 am the ISS will be high in the northern sky, very bright and moving East, a minute or so later it passes Jupiter (the brightest object in the sky aside from the ISS at this point, and then around 5:57 am it passes Mercury low in the north-eastern sky. For more ISS goodness, see Thierry Legault's amazing images of the ISS in 3D and the ISS and shuttle Atlantis in front of the Sun. 2000 posts! Time for a competition! I’m not really good at keeping track of my blog stats, and keep on missing anniversaries and so on. However, in 7 posts time I will have made 2000 posts on this blog since I started it in 2004. So it’s time for a competition. I have a copy of “The Hunt for Planet X” to give away. All you have to do is write about your most enthralling amateur astronomy experience, be it a stunning telescopic view, a meteor blazing overhead or sharing an eclipse with your family. Post your story in the comments here. The stories will be judged by myself and my family, and the best will be promoted to a post of its own as the 2000th post, as well as having a copy of “The Hunt for Planet X” being sent your way. At an average of a post a day, you have 6 days to write your story. Get to it! Paradise Regained (Les Johnson, Greg L Matloff, C Bangs) is a sweeping vision of how space science could buffer the Earth from a wide range of environmental woes, with Global Warming as a key exemplar. It is written in highly accessible language, and gorgeously illustrated by C Bangs. The book boldly takes us from the formation of the Earth, to the current environmental problems to the proposed solutions in space. And what solutions they are. Avid science fiction fans will already be familiar with proposals to mine the Moon for Helium three, to use asteroids for mining and comets for water and to have orbital power stations, but these innovations will capture other readers’ imaginations. However, all but the hardest of hard science fiction fans cannot fail to be moved by gravity tractors, and solar concentrators (which, after all, are designed to move asteroids and comets) and “Dyson Dots”. You may have heard of Dyson Spheres, the hypothetical all encompassing shells of matter Freeman Dyson proposed advanced technical civilizations would build around stars to capture all available solar energy. “Dyson Dots” are much less grand, but still quite amazing. Basically they are variants of the solar sail, but which can be much heavier as unlike the standard solar sail, which we want to move around, the Dyson Dot sails are meant to stay in place acting as a sunscreen, reducing the amount of sunlight reaching the earth in order to combat global warming. A fleet of solar sails just in front of the L1 point would effectively lower solar insolation without getting in the way of most astronomical activities Unless you are looking at the Sun, of course. The scale of this is staggering; you would need 70,000 10 km square solar sails, weighing about 37 million metric tons to reduce the solar constant by 0.25 percent. This array of solar sails has to be held in place by an intricate array of software constantly checking the position of the elements and modulating the sails. When I say Dyson Dots are less grand than Dyson Spheres, they are still stunningly, mind beggaringly HUGE in scale. While the authors emphasise the grand sweep of their ideas, they do point out the limitations of space based systems and other drawbacks, for example the act of mining the Moon will raise dust that will interfere with other Moon-based industries. BUUTTT … You knew there would be a but didn’t you. Events have overtaken some aspects of the book. The Constellation program, which would have supplied the ARES 5 heavy lifter, has been discontinued. In an effort to provide a broad sweep of history in a short space many aspects of biological evolution and the rise of civilization are turned into cartoon parodies of themselves. My “favourite” howler was in the section on evolution, on page 23, where the authors say “… a shellfish mutated to develop a crude interior skeleton. The first armoured fish … had evolved.” NO NO NO! This is so wrong its not funny. Another problem is the age of many of the suggested readings. No one could really argue with Attenborough’s “Life on Earth”, it’s a sensational book even now, but finding it will be problematical. Also, the science has moved on. There’s a lot of really good contemporary books out there (eg Richard Fortey’s “Life; an unauthorized Biography”; heck, even Bill Bryson’s “A Brief History of Almost Everything” would have been good). As well, the authors are pitching Space as a solution to environmental problems, with global warming as a particular case study. Unfortunately, global warming needs to be dealt with very soon. We are already committed to significant warming, and need to have mitigation systems in place before 2050 or even further warming will cause significant problems. To get the Dyson dots in place needs massive resources, NASA’s proposed Ares 5 would have been able to launch 188 metric tons, so you would need around 200,000 Ares 5 launches to build a sunshield (see above). Even if the Ares had not been canceled, you would need to launch an Ares 5 every day for 100 years to build your Sunsheild. We can’t even get a ISS supply mission happening once a week. Or you do it in space using asteroid mining. But you still have to develop and launch your space mining and orbital factory facilities. You still have to head out, find appropriate asteroids, guide them back into Earth orbit, mine them and build and launch 70,000 solar sails into the L1 point. That’s not going to happen before 2050 even with the best will and crash space development programs. Our children and grandchildren will be facing severe global climate problems before the very first solar sail is launched. And the cost! People who are quibbling over the cost of cap and trade vs carbon tax initiatives would faint (or go into apoplexy) at the cost of a Dyson Dot solution. 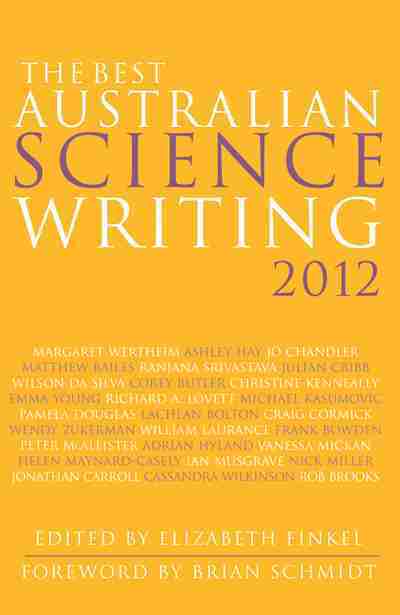 In summary, a fantastic, gorgeous broad sweep book buzzing with ideas, marred by technical errors and conceptual problems. Inspired by my first daytime Venus of the season, I tried to see if I could record daytime Venus with my mobile phone. Due to the limitations of the phone camera, I waited until the Sun was quite low, and lined Venus and the moon up on a conveinet building (the South Australian Museum as it happened, got at least one other person seeing Venus while I was lining up the shot). As you can see (if you click the image to embiggen it), it sorta worked. You can see Venus .. just, as a faintish dot just slightly more intense than the noise. I think that pushes the limit of mobile phone cameras. Just for balance, here's Sunday's conjunction with the mobile phone. No earth-shine but you do see the path of the Moon (when you click to embiggen). Venus taken with the mobile phone just after sunset. The Bad Astronomer has discovered the joys of daytime Venus spotting. He did quite well, picking up Venus when the Sun was more than 30 degrees above the horizon. Mind you, the Moon was very close to Venus, so it was easier to pick up, then again, the Moon was a very thin crescent, which can be hard to pick up too (on occasion I’ve needed to use Venus to find the crescent Moon. Today during my coffee break I popped out and had a look for Venus, normally I wait a bit longer during Venus’s apparition, when it id further from the Sun and thus further away from the Sun’s glare. Also, at this time of year Venus is rather close to the murk of the horizon. Nonetheless, hiding the Sun behind a large building, once I located the crescent Moon it took only a short time to locate Venus, working off the memory of where it was last night. 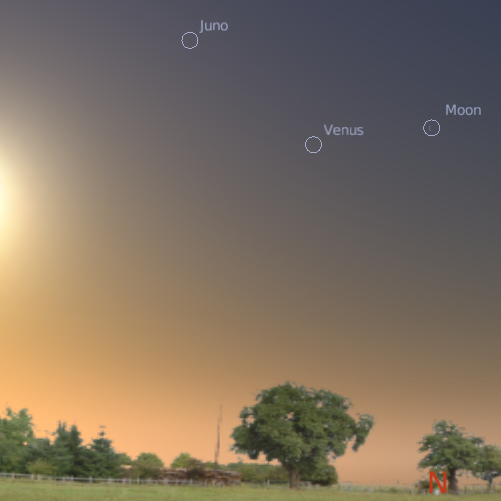 The next good opportunity to easily find Venus in the daylight is 15 June, when the 10% illuminated Moon will be just over a fingerwith from Venus and Venus 36 degrees away from the Sun (compared to today, when the 12% illuminated Moon was over a handspan from Venus and Venus was 28 degrees from the Sun). While the Moon is the easiest landmark to help locate Venus, you can use other methods to find Venus in the daylight. Remember to always be careful and make sure the Sun is hidden behind some solid object like a wall so that you don’t accidently expose your eyes to direct sunlight. The First Quarter Moon is Friday May 21. Venus is readily visible in the twilight. Saturn is seen in the evening above the northern horizon near the bright stars Regulus and Spica. On May 23 the Moon is close to Saturn. Jupiter is easily seen in the morning sky, with Mercury below it. On May 20 the Moon is close to Mars. 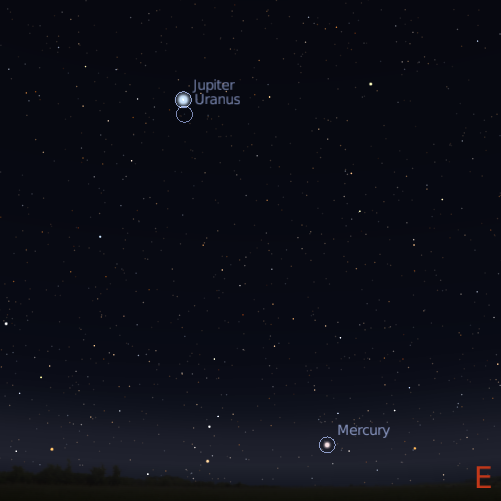 The morning sky facing north-east in Australia on Sunday May 27 at 5:30 am local time showing Jupiter Uranus and Mercury. The First Quarter Moon is Friday May 21. Saturn is rising before Sunset and is easily visible in the evening sky as the bright yellow object between the bright stars Regulus and Spica. On Sunday May 23 the Moon is near Saturn. Now is still a very good time for telescopic observation of the ringed world. On the 25th of May, Saturns' Moon Titan cruises just above the planets north pole. However, it is best to wait until around 9 pm, when Saturn is quite high in the sky for the best telescopic views. Saturn's' rings are opening, and look quite beautiful, even in a small telescope. If you don't have a telescope, now is a good time to visit one of your local astronomical societies open nights or the local planetariums. 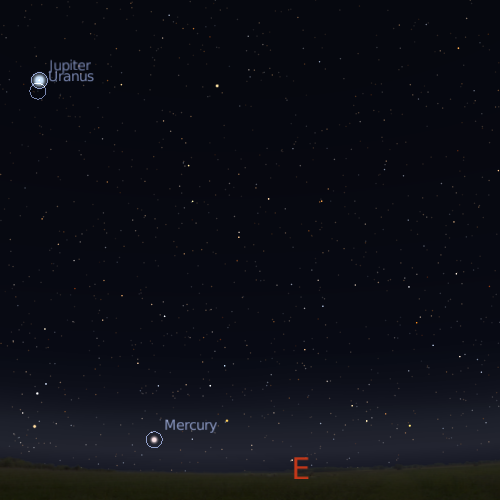 Mercury is in the morning sky and is visible low to the horizon below Jupiter. Bright white Venus is now readily visible above the western horizon from half an hour after Sunset, (even before) until the end of twilight (about an hour and a half after sunset). 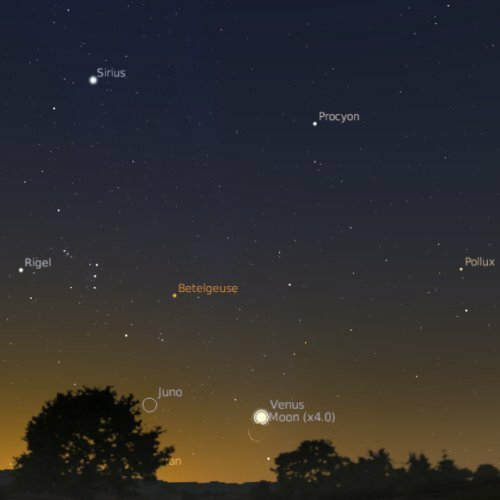 Venus stars the week not far from Gemini, as as the week progresses it comes closer to some moderately bright stars of this constellation. Jupiter is now easy to see in the morning sky as the brightest object above the north-eastern horizon. With Mercury below it they will make a fine morning sight. Uranis is withing a binocular field of Jupiter, and you can follow their progress as Jupiter comes closer to Uranus. 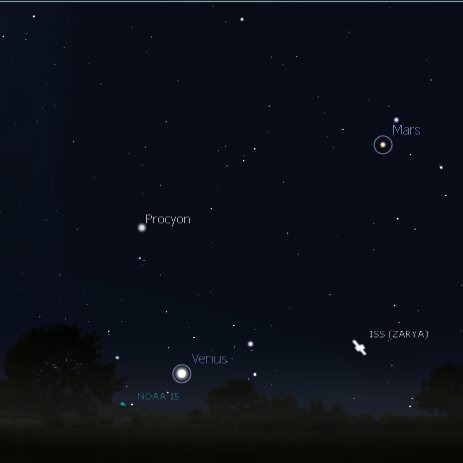 In the evening Mars can be seen low in the north-western sky. It has faded a lot, but is still the brightest (and clearly red) object in that part of the sky. Red Mars is in Leo, and is coming closer to Regulus, the bright star in Leo the lion. On Thursday May 20 Mars is close to the Moon. Thanks to Alan Garde for alerting me to this amazing image of the ISS through a spectrograph, not really an unexpected rainbow, but pretty. I'm number 7 in the 50 Awesome Blogs for Astronomy Buffs! Woot! 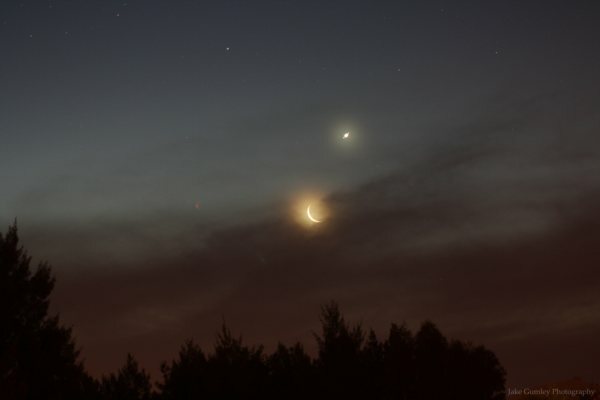 Left image, Venus, the Moon and Orion on Sunday May 16, 2010. The multiple dots are an aircraft passing through the field. Right Image, Venus and the Moon at higher magnification. Best to click on the image and embiggen for all the starry goodness happening in these images. Well, the Conjunction of Venus and the Moon went very well, the whole thing looked fantastic. It was a bit hard to see Elnath and Zeta Tauri, but they actually came out in the images. The sky colours weren't as vivid as last week, but the path of the Moon in the water was cool. Images from earlier in the evening. 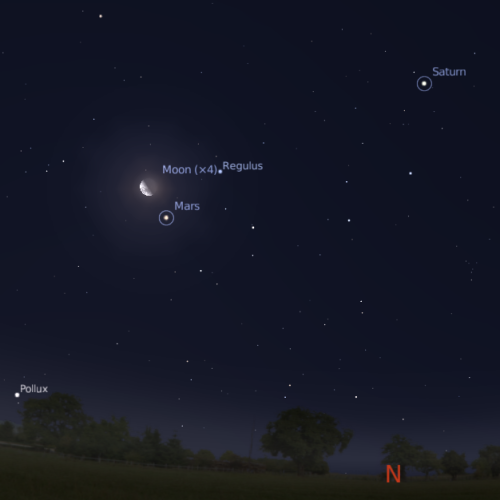 The evening sky facing north-west in Australia on Sunday May 16 2010 at 6:00 pm local time showing Venus and the Moon. Venus has a rather lovely encounter with the thin crescent Moon this Sunday evening. Night of the "Smiley Fritz" it is not, but with the thin Crescent Moon just below Venus, the pair between the two brightish stars that make the horns of Taurus the Bull (Elnath and Zeta Tauri), and with Orion nearby, this should be very beautiful. Start watching around half an hour after Sunset. Venus and the Moon will be obvious. As the twilight deepens, the other stars will slowly begin to emerge from the twilight glow, building up the display. Elsewhere in the world (Indonesia, South-East Asia, India, Northern Africa), Venus will be covered by the Moon. EDIT: pictures now up here. I can see Venus from Here! Jupiter in the morning as seen from Australia. Can you see Ganymede? My two recent posts have been on Global Warming silliness and Venus. In the intertubes, there is another confluence of Venus and Global Warming silliness as people try to claim there is no, or negligible, greenhouse contribution to Venus’s atmospheric heat. Now, other people have already done the work of showing why this claim is nonsense (see here, here and here), but I was bemused when some Velikovskian’s turned up to argue that Venus is hot because it was only recently formed. Now, this was only a minor drop of extreme silliness in a sea of nonsense, but as Velikovskianism made an appearance on the ABC science matters list, and this gives me an opportunity to give people some idea of the scale of the solar system, so I will hare off after the Velikovskian rabbit. Velikovski, as some may recall, famously suggested that to align established historical chronologies with biblical chronologies you had to insert catastrophes; including ones caused by a close approach of the planet Venus to the Earth. In Velikovski’s vision, Venus was ejected from Jupiter as a comet, which then careened around the solar system, coming close to Earth and stopping its rotation then starting it up again. The ejection of Venus from Jupiter, according to Velikovsky, was accompanied by tremendous electrical discharges and the dramatic separation produced the legend of Athena springing forth from Zeus’ (Jupiters’) forehead. There’s one small problem, ancient observes would have never seen it. Well, there’s lots of big problems as well , but at the very heart of it, the so-called “dramatic” birth of Venus would have been invisible to an Earth observer. To get a feel for the explanation, go out this morning around 5:30 am. Look up into the north-eastern sky and you will see Jupiter as the brightest object there. Can you see Ganymede? No? At magnitude 4.6 it is bright enough to be seen with the unaided eye under most suburban skies (and easily seen under dark skies). But it is too close to Jupiter for it to be separated out. Even under conditions where Jupiter is at opposition, and Ganymede is at its maximum separation from Jupiter, where theoretically you could see it, Jupiters’ bright light overwhelms that of Ganymede. It is possible to glimpse Ganymede at Jupiters’ opposition if you know which side of Jupiter Ganymede is on, and block out Jupiters’ light with a wall or some such item when Ganymede is at its furthest from Jupiter. The evening sky facing west in Australia on Sunday May 16 at 6:00 pm local time showing Venus and the Moon. But wait, you say, Venus is really bright, surely we would be able to see it easily! Well, no. Venus is only really bright because it is close to us. As you move Venus further away from Earth, it becomes dimmer. At the distance of Jupiter when it is at opposition, Venus would be roughly magnitude 3. Not astoundingly dim, about as bright as Gamma Crucis in the Southern Cross or Metsuba in Gemini. But it would be a fairly inconspicuous object, not the dazzling beacon of the twilight we are used to, and completely overwhelmed by the brightness of Jupiter (magnitude brighter than -2.5). Jupiter is this bright at that distance, even though it is darker than Venus, because it is really, really big, 10 times bigger than Venus. Jupiter’s brightness also masks the alleged “flashes of lightning” that Velikovsky claimed accompanied Venus’s birth. The brightness of ginormous lightning flashes arcing from Jupiter to a Venus sized object would be astounding. But they are even smaller than Venus, and quite drowned out by Jupiters’ glare. The impact flashes of comet Shoemaker/Levy were brighter than thermonuclear blasts, but no Earth-bound observer saw them with the unaided eye. So what would an Earth-bound observer see if Velikovskis' ideas were correct. For simplicities sake we will assume that ejection process took place during the opposition of Jupiter, when Jupiter is at its closest to Earth (and that the skies were clear and cloud-free the whole night, with no interfering full Moon to help drown out the light of the Venus-sized object). Also we will assume that this is in midwinter (when Jupiter is at its highest in the sky, and rises clear of the horizon rapidly). We will further assume the Venus sized object will become visible to a keen eyed observer under dark skies when it reaches the furthest extension of the orbit of Ganymede (allowing for the Venus like object to have an albedo of near 1 so being brighter than magnitude 3; and observers with really good eyesight; this is optimistic) and that the object is ejected tangentially to Jupiters’ orbit (that way it takes the shortest time for the Venus-like object to reach the furthest extension of the orbit of Ganymede. We are further going to assume that the Venus-like object is ejected at 60 km/sec, Jupiters’ escape velocity. It can’t be too much higher than this or the object will escape the solar system (and moderately higher velocities won’t change the argument much anyway). 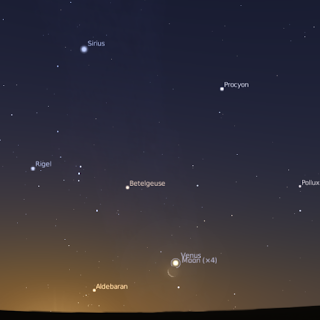 The evening sky at the time of the Opposition of Jupiter, in December 4001 BC (also from Australia, Stellarium messes up the view from Greece because it uses my computers internal clock for setting the time). Can you see Venus? Now, imagine yourself to be back in time 6000 years. You are a megalithic astronomer, or a guard on a hilltop fort stone fort in the area that would become Athens. Any occupation that means you are going to be hanging around in the night watches, rather than sensibly inside out of the cold, with an eye somewhere around the sky. At 7:00 pm astronomical twilight has just passed, Jupiter is glowing a modest distance above the horizon. Then something happens. What depends on the mechanism by which Venus is ejected. Some (very unlikely) mechanisms will result in no change, but let’s assume something dramatic happens and Jupiter briefly flashes as bright as Venus (whatever mechanism, the initially brightness change al la Shoemaker Levy impact will be transient). It may even go darker after this (if it was an impact say, and the darker material from Jupiters’ clouds were bought to the surface as in the case of the Shoemaker Levy impact). Whatever happens, we have now engaged the interest of our watchers, who pay more attention to Jupiter as it climbs in the sky, (in between going to the toilet, trying to keep out of the wind and looking out for any raiders trying to cross the forts walls). The observers continue to watch (the guard, going off duty, tell his replacement about Jupiter’s strange behaviour and the new guard keeps an eye on Jupiter, the astronomer just gets colder). 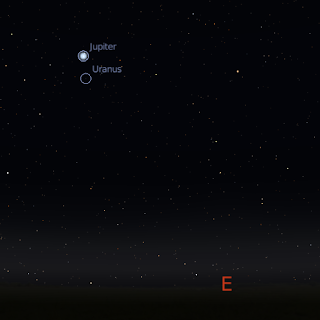 Finally around midnight, an undistinguished star is seen close to Jupiter. To the guard it’s nothing; unlike today’s folks most people then were intimately familiar with the cycle of the Moon, the bright stars and planets. But like todays folks the ordinary stars don’t leave much of an impression. The astronomer too mostly pays professional attention to the phases of the Moon, the rising and setting of bright stars and the northwards and southwards progression of Moon, Star and Sun rise and set as part of calendrical and ritual observations (as based on the evidence of megalithic observatories). While most non-bright stars are ignored (except where they make interesting asterisms like the Pleiades and Orions’ belt), the astronomer is sufficiently familiar with the sky to realise that something is different there and continues to observe. By the time twilight comes there is small but noticeable gap between the new star and Jupiter. If the Astronomer is lucky, and the weather doesn’t intervene, they will watch the new star slowly creep away from Jupiter. Could this be a new planet? A wanderer far dimmer then even Mars gets in its two yearly courses? Athena springing from Zeus’s forehead it is not. Like why Jupiter still has the Galilean moons, why Earth still has its Moon, they should have been ejected by a close encounter with a Venus sized object. Why was the object solid at all, it should have been red hot gravel and vapour. How do you get a rocky planet from Jupiter, a world that is mostly hydrogen with a little bit (comparatively) of water “ice” and some dirt buried below miles of metallic hydrogen? Why is Athena in the Legend, not Venus/Aphrodite? And so on. You can calculate the brightness of a molten, atmosphere-less Venus at Jupiters’ distance yourself as an exercise. And no, you can’t just move Jupiter closer in so you can see it in, it ejects or sweeps up the asteroids in the asteroid belt, we would have noticed. For Venus to reach magnitude -1, Jupiter would have to be orbiting where Vesta is. Carnival of Space #153 is here (in 3D). 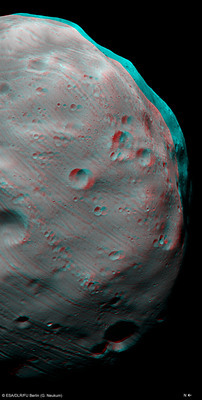 Phobos in 3D. 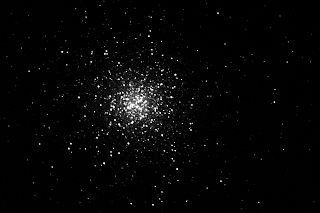 Image Credit ESA. Grab your 3D glasses, Carnival of Space #153 is now up at Cumbrian Sky in 3D. As well as stunning images, there is the final flight of Atlantis, Space Elevator games, models of Solar System formation, Artificial Intelligence amongst the stars and much much more. Grab the popcorn and rush on over. Venus has been spectacularly beautiful over the past week, glowing above some amazing sunsets. Unfortunately I haven't had my camera when this has happened. I did have my mobile phone, but the last time I used the mobile, stabilizing the camera was problematic. This time, there was a sign with wide edges conveniently placed, and I stabilized the mobile phone on top of the sign and against the pole the sign was on. I think it worked pretty well (Venus is upper left, just past the light pole). The camera was not even in night mode. I read the Australians' report of your address to primary school students in my home state. I read the brief report with significant and mounting disquiet. You, sir are in a position of considerable authority, and are the potential leader of this country. Thus, when you talk to primary school students it is very important that you get your statements and logic right. "OK, so the climate has changed over the eons and we know from history, at the time of Julius Caesar and Jesus of Nazareth the climate was considerably warmer than it is now,"
"And then during what they called the Dark Ages it was colder. " "Climate change happens all the time and it is not man that drives those climate changes back in history." "It is an open question how much the climate changes today and what role man plays." Not true, in the sense you are implying. We are committed to a warming world, whether we get 2 degrees or 7 degrees warmer by 2100 depends on how much we mitigate our greenhouse gas emissions. Currently, several of our warming indicators are tracking near the worst case scenario predictions, which is quite disturbing. It is also quite clear that human greenhouse gas emissions are the culprit behind most of this warming (see The Copenhagen Diagnosis for a simple and clear explanation). This is simple physics, you put in more greenhouse gasses, the world warms. The children you were speaking to could demonstrate this themselves with a simple experimental apparatus. You may not be impressed by foreign academies, but surely, as a possible future Prime Minster, you should not ignore the advice of the CSIRO that the world is warming, with humans largely responsible. The CSIRO is after all Australia's most respected scientific institution, to which the government goes for scientific advice. If you cannot accept the advice of this institution, what does this bode for your acceptance of advice on other issues that turn on scientific evidence. Mr Abbott, those children you spoke to are our future, as well as the ones who will be left with the legacy of our inaction of global warming. You, as a potential Prime Minister have a special duty not mislead these same children with incorrect statements and poor logic. EDIT: The The Roman Warm Period really did exist, but was not a global event, rather a largely European/North Atlantic one, based at least on changed ocean currents (see for example Earth and Planetary Science Letters Volume 213, Issues 1-2, 1 August 2003, Pages 63-78). And the most recent evidence is that it was not warmer than the medieval warm period (GEOPHYSICAL RESEARCH LETTERS, VOL. 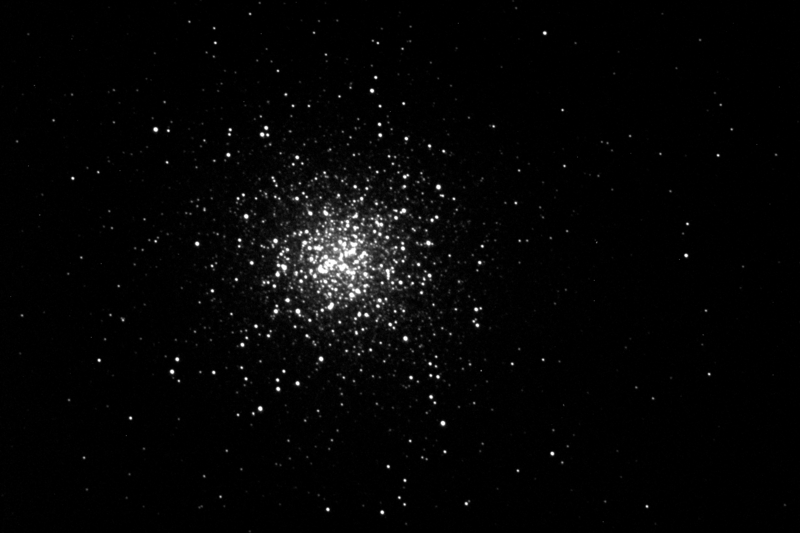 33, L20703, doi:10.1029/2006GL027662, 2006) except perhaps in isolated spots. So Mr. Abbott, when you get climate advice, make sure you get it from real climate scientists. EDIT AGAIN: Tim Lambert traces Mr Abbott's assertions to Ian Plimer. No wonder Mr. Abbott got it wrong. The New Moon is Friday May 14. Venus is readily visible in the twilight, on Sunday May 16 Venus is very close to the crescent Moon between Zeta Tauri and the star Elnath. 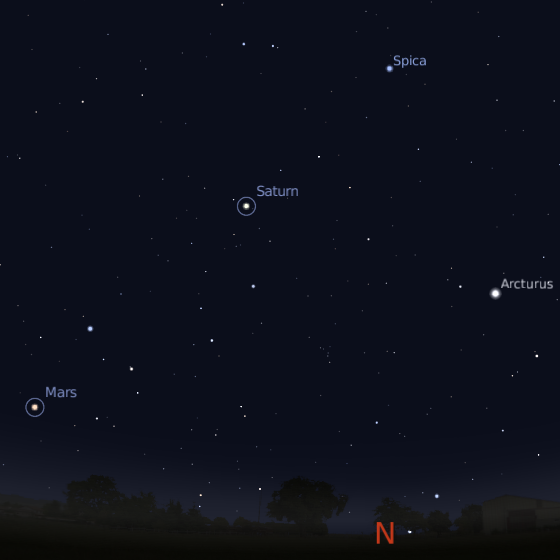 Saturn is seen in the evening above the northern horizon near the bright stars Regulus and Spica. 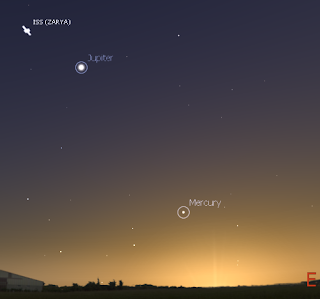 Jupiter is easily seen in the morning sky, with Mercury below it. On May 20 the Moon is close to Mars. The New Moon is Friday May 14. Saturn is rising before Sunset and is easily visible in the evening sky as the bright yellow object between the bright stars Regulus and Spica. Now is still a very good time for telescopic observation of the ringed world. On the 17th of May, Saturns' Moon Titan cruises just below the planets south pole. 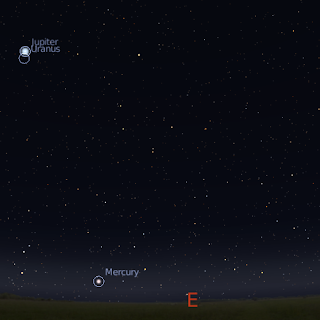 Mercury returns to the morning sky and is visible low to the horizon below Jupiter. Bright white Venus is now readily visible above the western horizon from half an hour after Sunset, (even before) until the end of twilight (about an hour and a half after sunset). Venus stars the week not far from the Hyades cluster and the red star Aldebaran almost directly between the two stars that make up the horns of the Bull (Elnath and Zeta Tauri). On Sunday 16 May the crescent Moon is very close to Venus (in some parts of the world it goes in front of it). As twilight falls and the Moons earthshine and the constellation of Orion becomes visible, this will be a beautiful sight. Jupiter is now easy to see in the morning sky as the brightest object above the north-eastern horizon. With Mercury below it they will make a fine morning sight. Evening sky looking North showing Mars, the Moon, Saturn and bright stars at 9:00 pm local time on Thursday May 20. Click to embiggen. 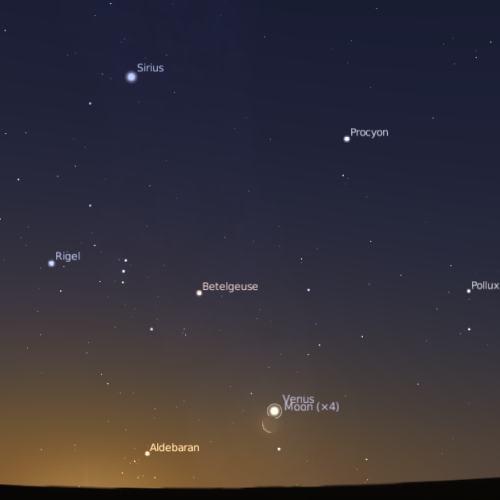 In the evening Mars can be seen low in the north-western sky. It has faded a lot, but is still the brightest (and clearly red) object in that part of the sky. Red Mars is in Leo, and is coming closer to Regulus, the bright star in Leo the lion. Southern Skywatch May 2010 edition is now up! Evening Sky as seen around 6:20 pm local time on Sunday May 16 in Australia. Venus and the Moon are close together between the horns of Taurus the Bull. 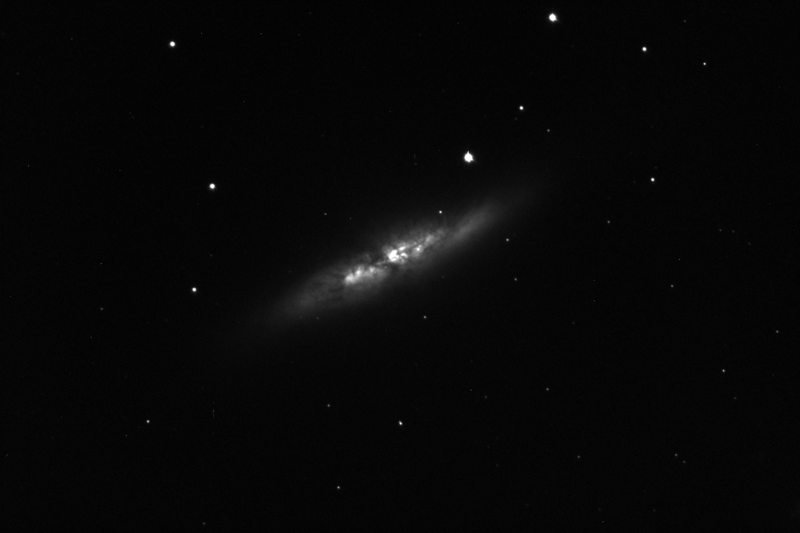 The Mayl edition of Southern Skywatch is finally up. There's observing Jupiter Mercury and the Moon, Venus close to the Moon and Mars close to the Moon. Jupiter comes within binocular distance of Uranus. ...so not much activity here, Southern Skywatch still delayed. 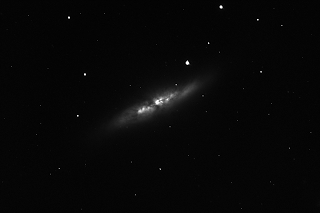 Another Virtual Telescope session got clouded out, so I thought I would post some images from an earlier session of NGC 5149, M82 and M13. Enjoy. Southern Skywatch has been delayed; work, kids stuff, visiting relatives all put paid to my out-of-hours time to write up the current edition, it will come though. Auroral events have been thin on the ground for a while here in Australia, but the South Pole Station All Sky Imager is back on line and has been capturing polar auroras for us to enjoy. Check out the Near-real time images. Carnival of Space #152 is here. Carnival of Space #152 is now up at the Martian Chronicles. There's the spectrer of bacterial contamination of Mars, magnificent Mars panoramas, radar images of asteroids, hypertelescopes, solar sails, Steen Hawkings' views on aliens and much, much more. Hoist your sails and drift on over. The Last Quarter Moon is Thursday May 6. Venus is readily visible in the twilight near the star Elnath. Mars enters Leo. Saturn is seen in the evening above the northern horizon near the bright stars Regulus and Spica. Jupiter is easily seen in the morning sky. On Monday May 10 the crescent Moon is close to Jupiter, on Wednesday May 12 crescent Moon is close to Mercury. 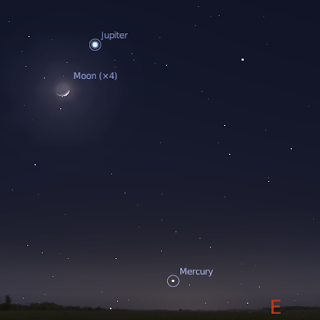 The morning sky facing east in Australia on May 10 at 6:00 am local time showing Jupiter and the Moon, with Mercury below. Saturn is rising before Sunset and is easily visible in the evening sky as the bright yellow object between the bright stars Regulus and Spica. Now is still a very good time for telescopic observation of the ringed world. On the 9th of May, Saturns' Moon Titan cruises just above the planets north pole. Mercury returns to the morning sky. You may have difficulty spotting it low in the morning twilight, but on the morning of Wednesday May 12 the thin crescent Moon is slightly above and top the left of Mercury. Bright white Venus is now readily visible above the western horizon from half an hour after Sunset, (even before) until the end of twilight. Venus stars the week not far from the Hyades cluster and the red star Aldebaran. Venus heads for the star Elnath, which tips one of the horns of Taurus the Bull. By the end of the week Venus is almost directly between the two stars that make up the horns of the Bull. You will need a flat, level horizon to see them at their best low in the late twilight sky. Jupiter is now easy to see in the morning sky as the brightest object above the north-eastern horizon. On the monring of Monday May 10 the crescent Moon is close to Jupiter. With Mercury below this will make a fine morning sight. 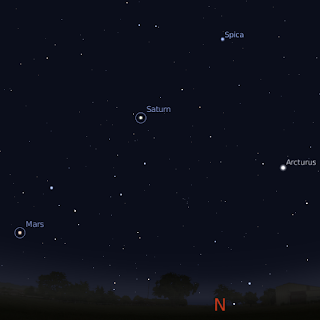 Evening sky looking North showing Mars, Saturn and bright stars at 10:00 pm local time on Monday May 10. Click to embiggen. 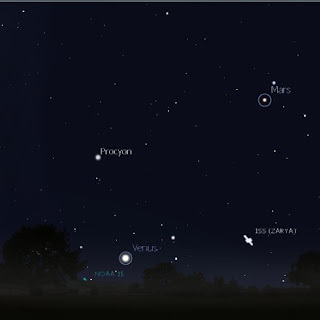 In the evening Mars can be seen low in the north-western sky. It has faded a lot, but is still the brightest (and clearly red) object in that part of the sky. Red Mars leaves the constellation of Cancer, and heads towards Regulus, the bright star in Leo the lion.